In advertising form. Not the real one. FIRST IT TRIED dipping its greasy fingers into the burrito business, now KFC is turning back the clock in a bid to kick-start sales. In a move that echoes McDonald’s recent revival of the Hamburglar, the fried-chicken chain has turned to its founder after a two-decade absence from TV screens. 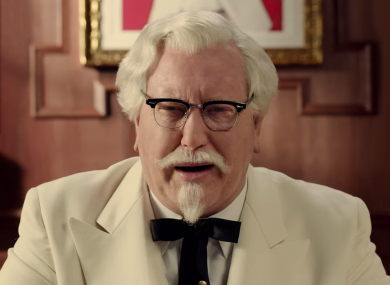 Colonel Sanders has made a reappearance in the latest US commercials for the company, 75 years after he supposedly invented the famous “secret recipe” (hint: it’s mainly salt and MSG). The company put the colonel, whose real-life namesake died a millionaire in 1980 at the age of 90, on ice in the early 1980s. Most recently, its ad gurus have been trying to give the brand a slicker image with efforts like its “music video in a lunch hour” – which doesn’t have anything to do with chicken at all, really. The throwback to the past comes as the big fast-food players struggle to hold onto customers amid demand for healthier food options, while they have simultaneously been hit by up-and-coming operators with new products and less baggage. KFC’s parent company, Yum Brands, suffered under last year’s food scare in China, where its restaurants have been losing their lustre, although at least it has been faring better than rival McDonald’s. Email “After more than two decades on ice, Colonel Sanders is back”. Feedback on “After more than two decades on ice, Colonel Sanders is back”.